Bridal gowns are the most treasured item a woman can purchase. 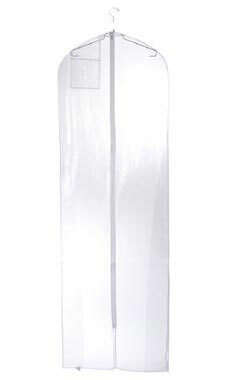 It's important to keep them protected and clean, which is easy to do with our Clear Plastic Bridal Gown Covers. With a full-length zipper, you can encase your bridal gowns for protection and display. Each plastic gown cover features a reinforced hanger opening for easy transport of your gowns, as well as a document pocket for layaway purchases and manufacturer information. Measuring 72" in length with a 10" gusset and 4 gauge in thickness, nearly any gown will be protected of tear, dust and damage. All wholesale gown covers are sold by the pack with 12 covers in each pack.